So don’t buy a travel-shag! Do yourself a favor, save some money and get a decent tent. A tent that won’t fly away at the slightest breeze, floats away with the first raindrop or a tent with a very inconvenient setup that you need an extra hour to pitch it every day. I bought a Hilleberg Saivo tent some years ago. I had to save some money for quite a while because they are anything but cheap. The Swedish tent manufacturer was founded in 1971 by Bo Hilleberg and produces the world best high tech tents. The materials they use are the best quality you can get, the fabrics are extremely robust, waterproof and very light, so are the poles, which are nearly impossible to break. Their tents are very well-conceived and you always have the feeling that the people who construct them know what they are doing! 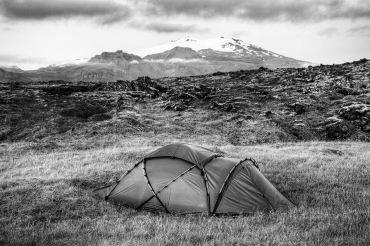 The Saivo is a 4-seasons tent made for people who don’t mind any kind of weather. The construction is very stable with its four 10cm poles, that cross at 7 points. The elaborated linkage between the rods, hooks, spanners and the suspended inner tent make it very easy to pitch on your own – even in the most adverse weather conditions. My Saivo resisted the heaviest storms without any problems and was dry on the inside even after a couple of days of hard rain. Its steep sidewalls make the inside very spacious – okay for 3 people, perfect for 2. The only disadvantage is the weight. You don’t want to walk up a mountain with 5.00 kg on your back…but if you want to buy a lightweight tent, no problem, Hilleberg has a wide variety of much lighter tents. In conclusion, I have to say that the Hilleberg tents are one of the best tents you can get, they last forever and they are worth the money charged for. I can assure you….you won’t regret it!